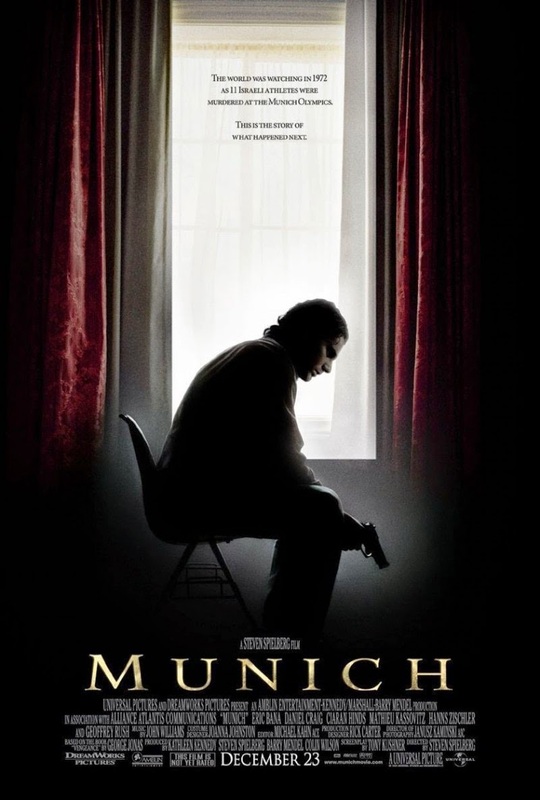 Munich, directed by Steven Spielberg (2005), is a visually intriguing film with a muddled storyline. The film itself looks gorgeous, processed in a “Bleach Bypass” method. The opening montage in particular is the films high point. Actors and archival footage interact with one another as the terrorists and counter-terrorists watch each other on TV. Lasting about 10 minutes or so (just guess off of memory – I did not count so don’t quote me), we jump around from group to group to group as the action unfolds on the TV, giving us a lot of information visually and through sound montage. Another effect that Spielberg uses in the film is the changing of focus from aspect to another. For, example, in any given shot, Spielberg might begin with a drivers face in car door mirror (Spielberg’s signature shot by the way) then move and focus to the cars window to focus on a passerby’s reflection, then move to a balcony that is about to be blown up. This type of shot is incredibly impressive to see in action and the entire film is shot in this changing focus style. This creates the sort of unease and visual metaphor for the morally grey area of the subject matter. Regarding the storyline, Spielberg does his best to present a very delicate topic, the Israeli-Palestinian conflict. In attempting to be fair to both sides, the film does engage in some slightly stilted speeches. However, it is not the speeches but during subtle moments that I found the most displays of humanity in the characters. In particular, there is a scene where Eric Bana’s character jokes with a target he is about to kill on a hotel balcony, who even offers the Bana character sleeping pills because of his loud suite neighbors. The storyline most suffers from lack of overall coherence. The assassins kill one terrorist and we next meet the assassination squad outside the next targets house/work/etc. Individually, the scenes are great, but strung together, they don’t quite mesh and some sort of segue would have been beneficial to the film.